[242 Pages Report] The welding gas/shielding gas is estimated to grow from USD 2.02 Billion in 2015 to reach USD 2.66 Billion by 2020, at an estimated CAGR of 5.70%. The segments considered for this report are based on type, application, end-use industry, storage, distribution & transportation, and region. On the basis of type, argon accounted for the largest market share, in terms of value, and is also projected to witness the highest growth rate. The metal manufacturing & fabrication end-use industry segment accounted for the largest share of the market, in terms of both, volume and value, among all end-use industries. The storage, distribution & transportation segment was dominated by the cylinder & packaged gas distribution. In terms of application, the market is segmented into gas metal arc welding, gas tungsten arc welding, and others. The final segment, that is, region, consists of North America, Europe, Asia-Pacific, and Rest of the World (RoW). The base year considered for the study is 2014 and the market size is projected from 2015 to 2020. The welding gas/shielding gas market is dominated by large players such as Air Products & Chemicals, Inc. (U.S.), The Linde Group (Germany), Praxair, Inc. (U.S.), Taiyo Nippon Sanso Corporation (Japan), and Air Liquide SA (France). MarketsandMarkets projects that the welding gas/shielding gas market is to grow from USD 2.02 Billion in 2015 to USD 2.66 Billion by 2020, at a CAGR of 5.70%. The market for welding gas/shieling gas industry is growing, courtesy of increasing applications of welding gas/shielding gas in the construction sector, growth in the aerospace industry, and rising demand for metal manufacturing & fabrication. Growing demand from the automotive industry also provides an opportunity to the market to further grow, especially in the emerging Asia-Pacific and Latin American regions. 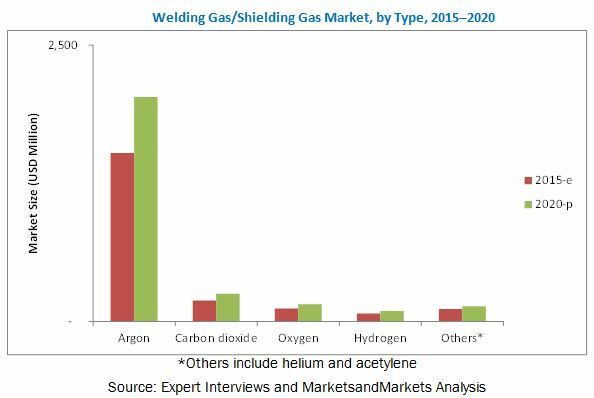 The welding gas/shielding gas market is segmented on the basis of type, application, end-use industry, storage, transportation & distribution, and region. On the basis of type, the argon segment held the largest market share, in terms of value, and it is also projected to witness the highest growth rate. The metal manufacturing & fabrication segment accounted for the largest share of the market, in terms of both, volume and value, among all end-use industries. The storage, transportation & distribution segment was dominated by the cylinder & packaged gas distribution segment. In terms of application, the market is segmented into gas metal arc welding, gas tungsten arc welding, and others. The gas metal arc welding segment is projected to grow at the highest rate, during the forecast period. On the basis of key regions, the market for welding gas/shielding gas is segmented into North America, Europe, Asia-Pacific, and Rest of the World (RoW). The Asia-Pacific region held the largest share among all regions in 2014. This is mainly due to emerging economies in China and India, coupled with growing applications of welding gas/shielding gas in the construction, energy, and automotive industries. Mergers & acquisitions was the major strategy adopted by most players in the market. Companies such as Air Products & Chemicals, Inc. (U.S.), The Linde Group (Germany), Praxair, Inc. (U.S.), Taiyo Nippon Sanso Corporation (Japan), Air Liquide SA (France), Gulf Cryo (Bahrain), Iwatani Corporation (Japan), Taiyo Nippon Sanso Corporation (Japan), SIG Gases Berhad (Malaysia), and Messer Group GmbH (Germany) were the key players who adopted this strategy to increase the reach of their offerings, improve their production capacity, and establish focus on core operations. Companies aim to serve the market efficiently by investing in manufacturing facilities and acquiring distribution centers in the fast-growing regions. Figure 50 SWOT Analysis: Praxair Inc.